And the New Year has come to us! It was from an open sea side or on a hill to watch the first sun rise of New Year best. Suzaki, at the east end of Edo, is especially known for it. The happy New Year was celebrated by the plays of Shishi-mai (lion dance), Mikawa comic dialogue, Kakubei-jishi (Kakubei's lion), Harukoma-odori (Harukoma's dance) in front of the house gate. Ogi (fan), Sugoroku sellers were treated also as happiness caller. 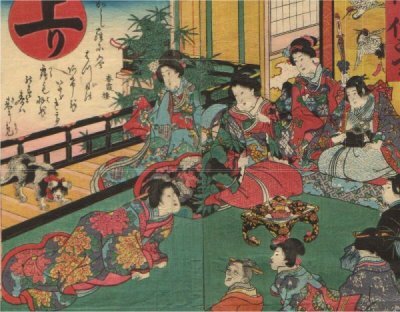 Sugoroku at those days were sold in paper bags with a print made by popular painters.